Members of the Queensland Acclimatisation Society in the nineteenth century played a key role in the importation and experimentation with many plants. Their motivations were not just scientific curiosity, but rather a commitment to furthering the prosperity of the colony through the economic outcomes of research. 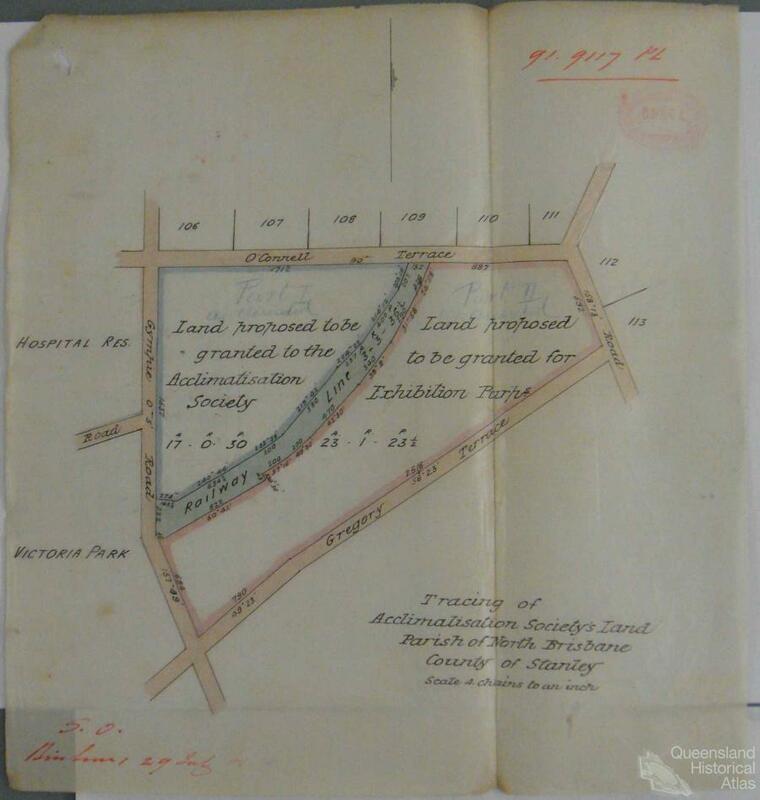 The Society obtained a large grant of land at York’s Hollow to the north of Fortitude Valley. The size of this land, which is clearly marked with a green boundary on the 1865 map of the city of Brisbane, reflects the importance given to the concept of ‘acclimatisation’ in Queensland. Acclimatisation in the nineteenth century was scientifically understood to mean the process by which animals and plants gradually adapt to climatic and environmental conditions different to those that prevailed in their original habitats. The interest in acclimatisation derived from early theories that the environment could bring about evolutionary change in species. In Australia, however, scientific theory was not a primary motivation and acclimatisation came to represent simply the exchange of plants and animals with other countries. Acclimatisation societies, established in all of the colonies, formed the advanced parties of the invasion of new plants and animals and were certainly among its most organised campaigners. Part of an international network of acclimatisation societies, their purpose was to introduce new species through exchange with other countries. Acclimatisation society gardens in each of the capitals, imported plants and animals, propagating and distributing them to subscribers all over the continent. Under the generalship of the societies, many foreign species entrenched and multiplied, invaded new territory and dominated the indigenous population. A member of the Victorian Acclimatisation Society is claimed to have introduced the first rabbits to mainland Australia in 1859. In 1868 the Queensland Acclimatisation Society boasted that the imported English sparrow ‘seems to be thoroughly at home, as it is building and breeding in (Bowen) park’. They later released the sparrows into the Brisbane Botanical Gardens. They also released large numbers of rabbits onto the Moreton Bay Islands. But by far the biggest impact in this invasion was achieved by introduced commercial crops and animals, essential for the survival of the implanted European civilisation. Eucalypts and Grevilleas were cut down in the path of foreign grasses, cattle and sheep; millions of acres occupied by food crops. The Queensland Acclimatisation Society played a key role in orchestrating these incursions. Founded in 1862 at the instigation of Sir George Bowen who became the first Patron of the Society, its inaugural meeting was attended by the busiest and most powerful men in the colony. The society’s objects were ‘calculated to afford powerful aid in the development of the material resources of the Colony and to assist in establishing its prosperity upon a sound and permanent basis’. They aimed to contribute to Queensland’s agricultural industries by introducing commercially viable plants. They also believed that by exchanging plants with other parts of the world, they would draw attention to the Queensland’s natural advantages and so encourage investment. The Brisbane Courier in April 1863 remarked that acclimatisation could bring commercial benefits. At first, the society fulfilled a much valued advisory role to the colony’s infant agricultural sector and it was supported by the government. They granted it about 30 acres of land at York’s Hollow, roughly where the present Exhibition Grounds are located, for its first gardens. Named Bowen Park after the first President, the remnants of the gardens now form a small council park opposite the hospital at Herston. The Society’s work became consumed with economic botany. It imported and experimented with many plants that are now important agricultural crops in Queensland. These included sugar cane, bananas, cotton, apples, pineapples, pasture grasses, maize, olives, mangoes, and macadamia nuts. The Society supported the sugar industry from its inception. In 1862 and 1863, it began importing cane from Mauritius and New Caledonia and distributing it to growers. It introduced and distributed West Indian varieties from 1900; it experimented with propagating cane from seed and worked with Colonial Sugar Refining Company (CSR) to build up seed supplies in the early twentieth century. It reported success with artificial cross-fertilisation of canes in 1904 and was responsible for producing a popular variety of sugar cane, Q813, which was known for its resistance to disease and was still in use as late as 1926. The Society’s emphasis on economic botany led to its decline. With the establishment of the Department of Agriculture in 1887 the Society outlived its usefulness to the Government and gradually lost Government support. Finally, it was forced to move from Bowen Park. The growth in popularity and importance of the National Association, later to become the Brisbane Exhibition, whose lands were adjacent to Bowen Park, contributed to this move. For years the Society had progressively conceded land to the Association. As it lost land, its operations became less viable. 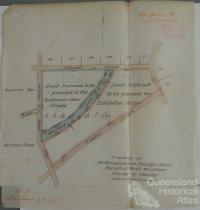 A drawn-out dispute between the Society, the National Association and the Queensland Government resulted in it selling the remains of Bowen Park to the Brisbane City Council and moving to Lawnton, a property it had purchased in 1905 and later to Redland Bay. It remained committed to researching and propagating fruits and crops with commercial potential. These included cotton, castor oil plants, avocado, pecan nut, grapefruit, Macadamia nuts and Pine trees. It claimed to have been instrumental in assisting to place many of these plants and crops on a sound commercial footing. It ceased operations in 1956, and its assets were placed at the disposal of the University of Queensland ‘for training young agricultural scientists and for research purposes in the field of applied botany and agriculture’.